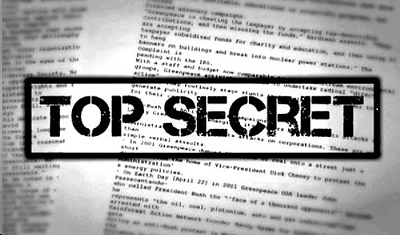 It appears that by today’s government and journalism standards, Top Secret is a term for fiction writers. Arguably the nation’s most prolific and successful non-government organization that investigates and exposes government and political corruption on Tuesday released what amounts to another stain on the reputations of former Democratic presidential candidate Hillary Rodham Clinton and General David Petraeus (U.S. Army Ret.). The graphic (above) was part of a presentation on the current cybersecurity threats and solutions to enemy infiltration of government cyber assets. 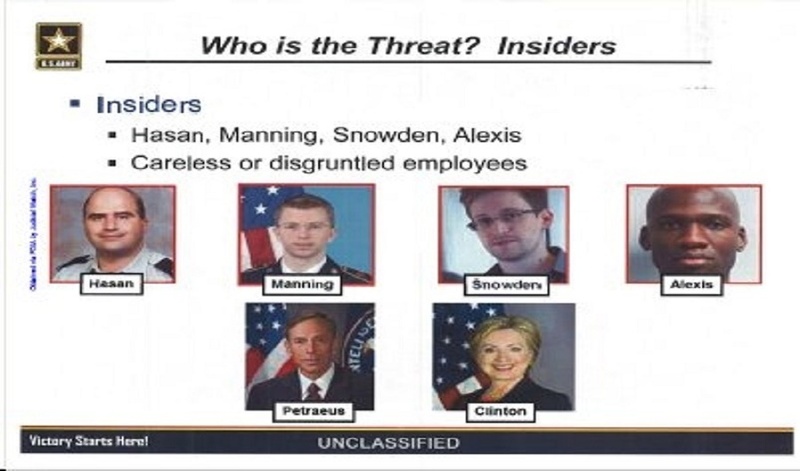 Those included with Clinton and Petraeus are terrorist and former U.S. Army Major Nidal Hassan; military-intelligence leaker Bradley Manning (a/k/a Chelsea Manning); intelligence “hijacker” Edward Snowden; and the Washington Navy Yard shooter Aaron Alexis. The informative documents were obtained by Judicial Watch officials in response to a Jan. 11, 2017, Freedom of Information Act (FOIA) lawsuit in the U.S. District Court for the District of Columbia seeking this specific PowerPoint presentation on operational security delivered to U.S. soldiers at Fort Leonard Wood under the command of Major General Kent D. Savre. The lawsuit was filed after the Pentagon failed to respond to an Aug. 22, 2016, FOIA request for the PowerPoint presentation. It also cites “unsecure email” as an error that can lead to an enemy being able to “Kill, Counter, Clone.” Judicial Watch’s investigations into Clinton’s email practices while secretary of state repeatedly produced examples of Clinton aide Huma Abedin sharing the schedule and travel plans of Clinton on an unsecure email system. Copy of one of the U.S. Army’s PowerPoint pages that was obtained by Judicial Watch investigators. The operational security brief was reportedly leaked, and then posted on the Facebook page “U.S. Army W.T.F! moments.” Administrators of the Facebook page said a picture came from a service member stationed at Fort Leonard Wood in Missouri, according to a Judicial Watch press statement on Wednesday. Surprisingly, Clinton and Petraeus are cited as examples of “Careless or disgruntled employees.” Former Secretary Clinton conducted official government business using a non-state.gov email account, which was hosted on a server in her home in Chappaqua, New York. Judicial Watch’s extensive FOIA litigation pried loose Clinton email records, which proved she sent and received classified information on an unsecure server while serving as secretary of state. “The fact that while Clinton was running for POTUS she was being discussed in a cybersecurity training session as an ‘Insider Threat’ along with the likes of a mass-murdering jihadist [Maj. Nidal Hassan] and an intelligence thief shows the attitude toward misconduct and crime displayed by Democrats,” said former U.S. Marine and police detective Michael Snipes. “In my opinion, she [Clinton] is lucky she only lost an election and had almost the entire news media hacks in her pants-suit’s back pocket,” Snipes quipped.